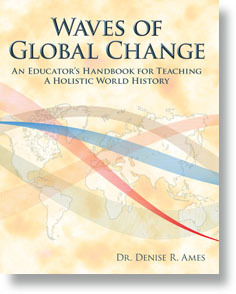 Veteran educator Dr. Denise R. Ames has written this handbook especially for pre-service teachers and educators K-university in order to differentiate how this holistic world history is taught from traditional world history. Illustrated, index, glossary, source notes, and bibliography. This book is for veteran educators and pre-service teachers/instructors. Each chapter includes "Questions to Consider," spurring critical thinking and "seeing" the information differently. Organized into eight chapters, the book is chock full of activities, suggestions, pictures, and graphic organizers to heighten understanding! The purpose of this book is to help educators conceptualize and teach world history in a more holistic way by using a systems approach, a global perspective, and examining historical patterns. 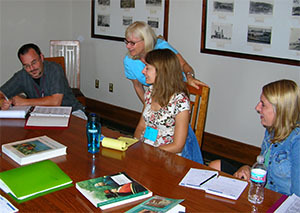 Laying out the principles of the holistic world history model for educators to use directly in the classroom, the book is a valuable tool in understanding the holistic model and how all the parts can be successfully pulled together into a thought-provoking and challenging world history course. Chapter 1. An Introduction to a Holistic Teaching Model for Educators... introduces the holistic approach used in this world history. Chapter 2. Systems Thinking: An Approach to Understanding a Holistic World History... describes systems thinking and makes suggestions on how it can be applied to world history. Chapter 3. Worldviews: The Way We Look at the World... examines five worldviews – indigenous, modern, fundamentalist, globalized, and transformative – that inform our ways of thinking today. Chapter 4. Waves of Global Change: A Holistic World History Model... explains the five waves, five comparative currents and twenty-five sub-currents. Chapter 5. 20 Advantages of a Holistic World History Model... lists and clarifies the 20 advantages with examples given as well. Chapter 6. Circle of Learning... illustrates a way in which world history can be taught that utilizes 6 different skills: remember, understand, apply, analyze, evaluate, and create. Chapter 7. World History Teaching Tools and Strategies... highlights 14 suggestions and examples for helping to make this holistic world history come to life. Chapter 8. Strengths and Weaknesses of the Holistic World History Model... gives a final wrap-up to this holistic teaching approach.